Its almost 6 months since I posted to this blog. 2015 has been a year of exciting changes, great tragedy and huge challenges. I returned to Nepal in April to continue research into the fine crafts - an exhibition planned for autumn 2016 in Lahti Art Museum and after only a few weeks I experienced one of the most traumatic events of my life. The earthquake of April 25 and the devastation it wreaked on the nation had a profound impact on me though it has taken many months to realize. Slowly I am finding my way back into my project, making plans again and feeling positive that this exhibition is of more importance now than it was before the quakes. 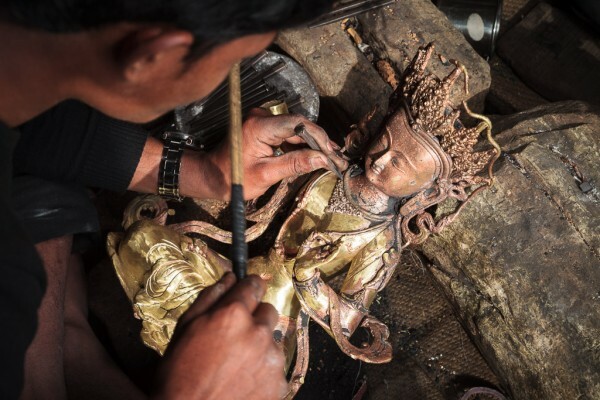 Nepal has many gifted crafts people who are now struggling against the odds to maintain their livelihoods. Many studios suffered losses - family members and homes and whole communities in the hills around Kathmandu were destroyed. It is my hope that this exhibition will bring to light the remarkable skills and artworks of these people and through this show highlight their work and the dedicated lives they lead making both secular and religious art works of exceptional beauty. In these coming days I'm meeting deadlines for grant applications and hunting for supporting partners. I returned to Kathmandu to work with a close friend of mine Rewati Gurung on a project we started together to support school children after the earthquakes destroyed more than 500 government schools in Sindupalchok. Moving Mountain School Bag provides the tools needed to get these kids back into their learning habits and show them that education is the key to a better future for them and their country. This web was hacked through a security hole in the comments forms and so now comments will not be available. The trouble this has caused to my working life is hard to describe - and it is only through the hard work of my very good friend Chhitesh Shrestha at Plutonitech that this is back up and running again. My paper project - Japanese Kozo Paper Thin - has also met some challenges. While the paper shows great promise - the qualities of this media are unlike any other paper on the market - major markets like the USA and China are not taking interest. The USA is a volume driven market and as a result they don't see this having a strong enough place in their paper range to start marketing it. Maybe one day they will have a change of mind. I'm getting regular mails from people in the US who want to use it but the cost of ordering from Europe is too prohibitive. And Chine. Well, China won't take the paper because the quality of the print is so good they are worried about forgeries being passed off as originals. How about that? My paper is too good! Here in Finland the days are turning cooler after an amazing tropical August. Driving through the landscape I see how beautiful this land is in this golden northern light. The yellow fields are ready to harvest, the deep green of the trees and forests and the flat calm mirrored lakes show just how the Finns cherish their environment. I feel lucky to live here, lucky to be among people who care about where they live and export their care in projects to developing countries like Tanzania, Namibia and Nepal. There are still a few issues with this website - placing of text can sometimes be a bit strange - but I hope these issues will be resolved soon. For now I'm back to writing my applications in support of the Treasure of Nepal exhibition.